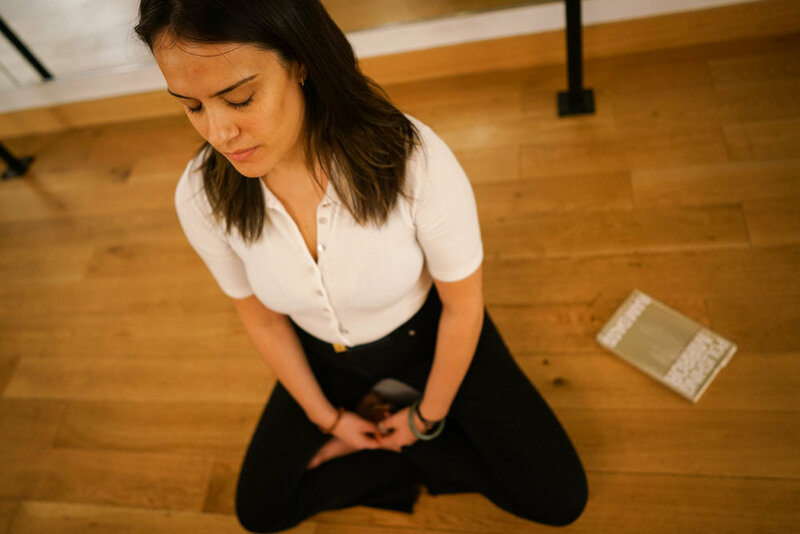 The author Kristina Headrick teaching meditation, after graduating from The Path, Nalanda Institute and Pure Yoga teacher training January 2018. When a journey comes to an end, it’s common to feel a conflicting mixture of sadness and relief. Think of a trip or major event you meticulously planned and looked forward to for a long time. Once it’s over you likely feel a bit sad and empty, but also inspired. My own state after meditation teacher training was not dissimilar. On the one hand, I no longer had to take multiple trains to the Upper West Side. That was cool. On the other, I was losing something I looked forward to and became deeply immersed in. And that’s saying something, because I’ll go to great lengths to avoid complicated ventures on the MTA. All cliches aside, the training shifted me in ways I’m still unpacking. I was much more aware of habits and standards in my life that that had to be left behind. I let go of some old friendships. Sure, my Wednesdays and a few weekends opened up again, but I found a renewed hunger to keep learning. And something even wilder has happened. I meditate every day now, almost reflexively. Oh, the power of time, repetition, and community. And that is a major take-away: I have compassion for my own timeline. One of the things I wish our culture extolled more is just that THINGS TAKE TIME, and that that’s ok. I’ve been trying to form a daily meditation practice for years. Only now can I see with a lens of compassion that it had to take those years, unwanted suffering, and this course, to get me there. Mindfulness isn’t cultivated overnight. It’s cultivated every single day. Especially those days where you find yourself so reactive, you wonder if you should even call yourself a meditation teacher in the first place. Having been surrounded by viciously motivated New Yorkers, I realized my own way of doing things, no matter how long it may take, is actually perfect. But what really made this so transformative was meeting and learning from our teachers. To learn from such knowledgeable, compassionate, insightful humans such as Joe Loizzo, Geri Loizzo, and Marlie McGovern is enough to leave you with an afterglow that warms any heart hardened by a New York winter. There was a softness to these teachings which ultimately allowed to depth to sink and settle deeper into my psyche. The progression of this course was a joy to experience, each lesson unfolding naturally into the next. Watching your fellow classmates step into their power as teachers is also something I’ll never, ever forget. It kind of makes me want to do teacher training all over again. But I see now that it’s not my time for that. The journey ended in graceful timing. I’m humbled by what I learned and witnessed. Moreover, I feel humbled by who I learned from and with. We are nothing without our communities. And so I’m challenging myself to teach weekly, both for my community at the lovely, wellness-focused co-working space Primary and however else I can. I’m so grateful for Nalanda Institute, The Path, and Pure Yoga for creating a program that delivers on transformation — both for self and in the communities it buds. Finally, I can’t wait to see what my fellow grads accomplish. That will be the greatest joy of all! Older PostCompassion - at Harvard Business School! ?